As I prepare to train leaders in Africa, I am reminded again of our mission from Isaiah 55: Empower the weak and frail: heal marriages and bad relationships, restore damage from unbelief and enable to withstand the power of the dark forces to carry out God's great works. Our training is not an intellectual exercise but the extension of God's light across the world. We desire and work toward widening the entrance for the light to enable God's people to embrace significant changes in their lives and ministries. My first visit there, surrounded by a cornstalk meeting place, is etched into my mind by their great desire to know God's Word. Powerful images of many orphans, difficult marriages and the shallow teaching of God's Word still fill my mind. Many requested I return to give a marriage seminar translated into their language. Liwonde, my second stop, is where I will hold two seminars, one on discipleship and another on parenting. The brother organizing the ministry here has a great heart for discipleship training, which includes opening a secondary Christian school that actually uses Christian curriculum. Though many Malawians know the Lord, their faith is weak. They do not know the power of God's truths to set them free to see the full power of the Kingdom of God. There are other requests to teach there, but I also need to visit Ethiopia on this trip. Following up on last year's Discipleship I seminar, we will hold Discipleship II this year. They will be trained in the specific skills needed to overcoming temptation and grow strong in faith. Travel costs increase each year due to higher oil prices. 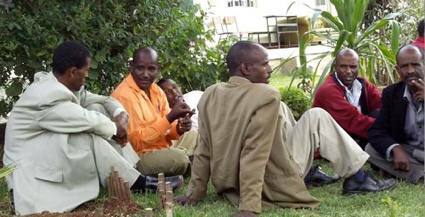 Some pastors travel more than a day to attend, but they are glad to be able to meet. At this point, we do not have a single dollar donated for this training trip to Africa. I have been away from home caring for my parents in the south (my Dad just celebrated his 91st birthday and lives alone). God is faithful and will provide. He always has. Our expenses will probably exceed $10,000 due to the increase of air travel, and translations and printouts of the four handouts. For those wanting to invest in this STM please mail your gift to my office address below, with the check written out to PCCO (see right). I will place it in our church's (PCCO) offering, and they will send you a tax deductible receipt at the end of the year. Write BFF STM in the memo to ensure it will be used for Short Term Mission trips. Started co-teaching Knowing God in our local church, Oakland International Fellowship (part of Pittsburgh Chinese Church in Oakland - PCCO). Praise God Pastor Godstime's daughter, Esther, recovered from her serious case of Malaria. Thanks for praying! Able to get a great physical workout while visiting and caring for my parents in the south – ocean swimming, trimming branches, long beach walks, teaching children to play tennis and ping pong. 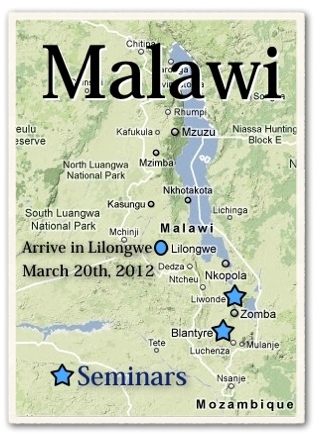 The Malawi marriage handouts in Chichewa are finished! Significant progress on tax information sheets. Airplane tickets are secured. Visas can be secured at the airports. Watch over Paul and Linda's parents in their later years. Hope to finish these tax papers before leaving for Africa on March 19th. Oversea pastors continually request laptops. If you have a spare one, pass it on! Preparations as Paul teaches upcoming Knowing God: Experience and Love Him classes.